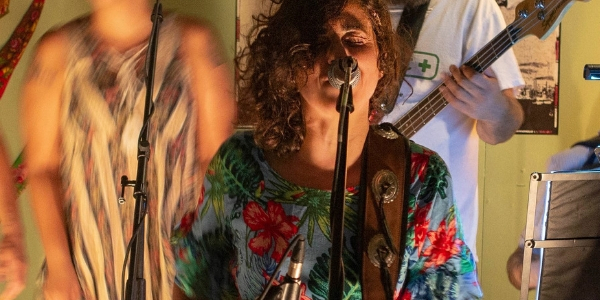 Formed in 2011 through an organic collaboration between Brazilian and Canadian musicians living and working in the diverse music scene of west-end Toronto, Maria Bonita and The Band plays forró pé de serra. Lead by the dynamic and charming Jerusa Leão, the group has performed in several local Toronto venues including the Dakota Tavern, the Gladstone Hotel, Lula Lounge and the Great Hall, and have regularly performed as part of festivals and events put on by the Fedora Upside Down collective and Uma Nota Culture. Other performances have included a workshop at Massey Hall for the Share the Music Foundation, the Small World Music Festival, Expressions of Brazil Festival at Harbourfront Centre and Toronto’s Brazilfest. In the summer of 2018, the band did a popular summer residency at Drom Taberna, Toronto’s newest go-to for intimate live music. Incorporating rabeca (Brazilian fiddle), zabumba (two-toned drum), accordion, triangle, and a chorus of vocals, Maria Bonita and The Band plays original compositions and also interpret the greats of classical forro so beloved in Brazil.